Note: I am no longer able to buy Dale Garn yarns. Once my stock of yarn is gone, I may not be able to offer out of print patterns, so if you want to knit an old design, get your yarn pacs soon! If you need to use a substitute yarn I am now stocking Rauma yarns that are interchangeable for the Baby Ull, Heilo and Falk. 2013 Norwegian Biathalon sweater for the family. IN NORWEGIAN. Setesal, Sirdal & Fana variations for the family. Questions, comments or suggestions? Email Us. Copyright © 2003-2019, Kirtland's Yarn Barn. 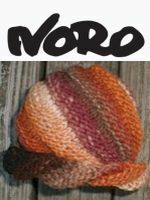 Several older Noro bulky weight yarns are available at 20 – 40% off. I have sweater quantities of some and enough to whip up a quick hat or scarf of others.